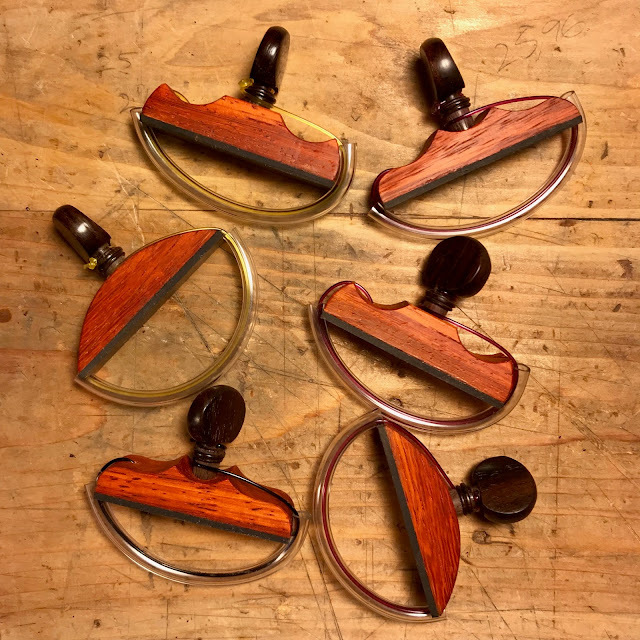 Capos/Cejillas - New Batch of Six Padauk Wood Capos! Stocking Stuffers for Your Favorite Classical Guitarist! This week has been dedicated to making 1970's retro style cejillas, or capos, for classical and flamenco guitars. Traditional cejillas used leather straps to protect the guitar's neck from the string that goes around the next and is attached to the peg that tightens the string. In the 1960's and 1970's several capo makers in Spain put vinyl tubing over the string for protection. I think the vinyl tubing was used partly for economic reasons: it is cheaper than leather and it makes assembling a capo go much faster, plus some of the capos being sold were made from Galalith, a material made from casein and formaldehyde, it looked like plastic and was used to make jewelry. The vinyl tubing went well with the look of the Galalith. I use vinyl tubing because it allows me to assemble a capo much faster than using a leather strap. I want to make affordable capos, every classical /flamenco guitarist deserves a wooden capo! The bodies are padauk with East Indian rosewood pegs; neoprene face; vinyl tubing and the string is a LaBella brand 3rd guitar string. String colors are either black, gold or red. These are my current capo shapes. A is a very traditional shape, this shape dates to the late 1600's, early 1700's. B and C are my interpretation of two shapes used by several traditional Spanish capo makers. $30 for each capo, shipping and handling are extra. 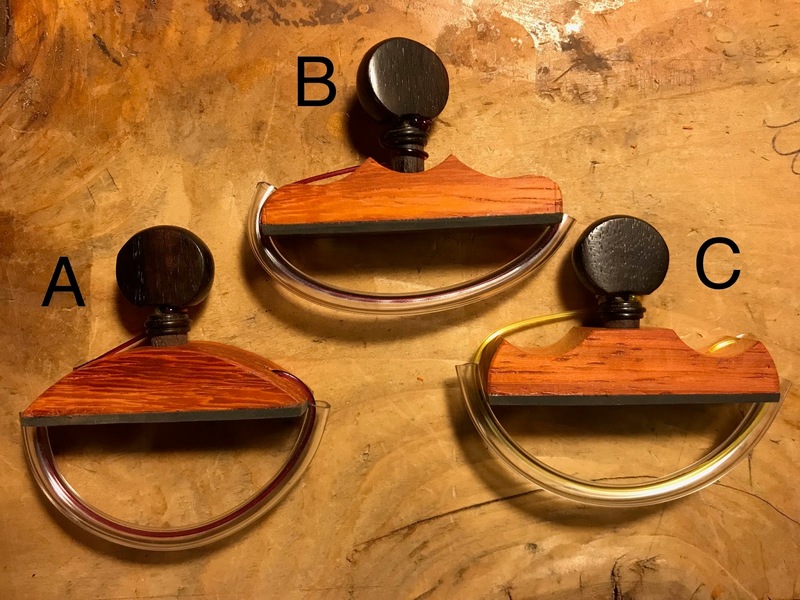 Due to CITES (Council on International Trade of Endangered Species) regulations, I am unable to ship these capos outside of the United States because of the East Indian rosewood pegs. I don't make enough money off of these to warrant getting re-export certificates for each capo. I can make these capos with boxwood pegs.